A council for leaders in independent regulatory agencies, CIRA's goal is to provide a forum to discuss issues common to these agencies. Because independent regulatory agencies are subject to limited OMB oversight, they have limited mechanisms for sharing information and solving common administrative problems. Past CIRA meetings have addressed issues of common interest, such as the use of cost-benefit analysis by independent regulatory agencies, international regulatory cooperation, best practices under the Government in the Sunshine Act, and agency practices for dissents in rulemakings. 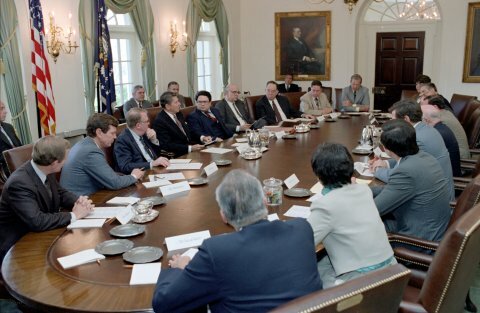 In the image above, President Ronald Reagan is addressing agency chairmen at the White House during the initial CIRA meeting on April 16, 1982.